In a matter of months Intel will be officially releasing what may end up as its furthest reaching microprocessor architecture of the next decade, yet hardly anyone is talking about it and it's rarely characterized properly. Let's get the names straight first. Silverthorne is the processor, it's Merom-x86 based (no SSE4). Poulsbo is the chipset. The combination of the two is referred to as the Menlow platform. I've often referred to Silverthorne as the processor Apple wanted to use in the iPhone but couldn't. In spirit there's truth in that statement, but practically it couldn't happen. Silverthorne won't be able to fit in something the size of an iPhone, it's not cool enough, it's not integrated enough and it's just not ready for that market. Intel believes it will be ready in about 3 years, I tend to agree. But Silverthorne is launching this year, soon in fact, and there are still many unanswered questions. We know from CES about the types of devices we'll see it used in. Intel calls these Mobile Internet Devices, or MIDs, they are small devices that can be used to browse the web, check email, use chat clients, play music, view photos, etc... These MIDs will either run Vista or Linux, the majority being Linux due to lower system requirements and cost. They will all be significantly larger than an iPhone, but their intended use is also a bit more strenuous (in theory) than an iPhone. Since Silverthorne is an x86 microprocessor, these MIDs will be able to run virtually any x86 application. Intel is quick to point out that Silverthorne based MIDs will be able to run the "full Internet" including Flash, whereas the iPhone can't. These MIDs won't double as cell phones, so you'll still need to carry one of those with you but the idea is that a MID will be with you instead of your laptop. It'll be a lighter, more functional device, with a much longer battery life. Think UMPC but actually useful. 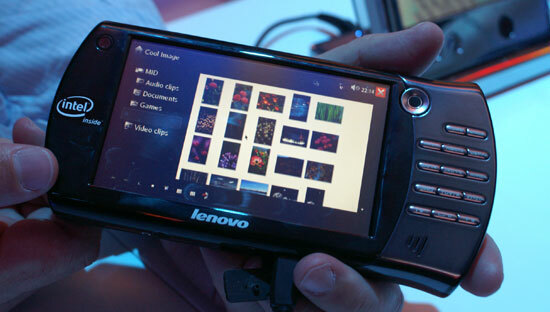 The problems with UMPCs (Ultra Mobile PCs) were numerous; you need a custom UI for a device that small, most of the devices failed miserably in this regard. The Vista UI just doesn't scale well down to that small of a size. The physical interface with the devices was also flawed, Apple showed us how it needed to be done with the iPhone and unfortunately no UMPC maker or software vendor could adapt in time. Then there's the hardware side, these things used CPUs that were far too slow for what we were asking of them. Full versions of Windows running on single-core CPUs running barely faster than 1GHz just wasn't enough for the sort of responsiveness we were hoping for. UMPCs, much like Portable Media Centers before them, were simply ahead of their time. In many ways I expect MIDs to be the same, but there's one major difference: this time we're starting with hardware designed for the task at hand. Instead of scaling down a Core based processor, we're starting from scratch with a brand new mobile CPU called Silverthorne. If you remember the months before Centrino was launched, in many ways you're in for a repeat. "The at 2.0GHz, running at 1.0V, Silverthorne runs at 90C and dissipates 2W. The CPU temperature alone should be indication that this is too hot for an ultra small iPhone-like form factor"
When the specs state TDP power at a given temperature, they are not claiming that the chip will dissipate that high of a temperature. They are baselining the TDP measurement, because leakage varies over different temperatures, and TDP needs to account for worst case conditions. It is standard practice to use the max Tcase temperature as a baseline, which is the temperature that the chip cannot exceed without permanent damage. Most chips operate WELL BELOW this. this just doesn't make sense... if it uses (and dissipates) less power than the scaled-down core cpus that are already in UMPCs, why would it's temperature be higher? why would it be harder to cool? why would it not be feasible for UMPCs? oops, yeah. you said it wont be feasible for an iphone, not umpc. UMPC is about twice as big as an iPhone. "Inevitably the comparison to VIA's recently announced Isaiah CPU will be made, but Silverthorne is really aimed at a different market. Isaiah is a higher performance out-of-order core, while Silverthorne is eventually designed to make its way into highly integrated CE devices. We expect VIA's latest creation to outperform Silverthorne"
I've never believed I'd live to see that - VIA outperforming Intel.